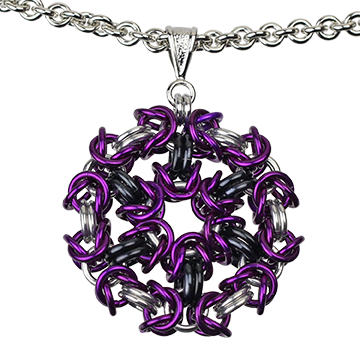 Mix anodized aluminum with plain aluminum jump rings to create a customized geometric chainmaille pendant 1.5" in diameter. This lace-like variation of the well-known Byzantine weave was created by Blue Buddha designer Darlene Ostrowski. Main photo: Byzantine Medallion with red Byzantine units, aluminum connectors, & orange med. thick rings. Below: violet Byzantine units, aluminum connectors, & black med. thick rings. This project uses techniques learned in our Byzantine tutorial; you must be familiar with Byzantine in order to make this project.